ASP.NET MVC 6 Hosting - HostForLIFE.eu :: How to Get Lookup Data in ASP.NET MVC 6? In this article, I will explain about getting lookup dataa into you view ASP.Net MVC 6. This is a super common problem I encounter when building ASP.net MVC applications. I have a form that has a drop down box. Not only do I need to select the correct item from the edit model to pick from the drop down but I need to populate the drop down with the possible values. This filter also adds a degree of caching to the request so that we don't have to keep bugging the database. Keeping a lot of data in the view bag presents a lot of opportunities for error. We don't have any sort of intellisense with the dynamic view object and I frequently use the wrong name in the controller and view, by mistake. Finally building the drop down box using the HTML helper requires some nasty looking casting. Any time I cast I feel uncomfortable. Now a lot of people prefer transferring the data as part of the model; this is the second approach. There is nothing special about this approach you just put some collections into the model. I've always disliked this approach because it mixes the data needed for editing with the data for the drop downs which is really incidental. This data seems like a view level concern that really doesn't belong in the view model. This is a bit of a point of contention and I've challenged more than one person to a fight to the death over this very thing. So neither option is particularly palatable. What we need is a third option and the new dependency injection capabilities of ASP.net MVC open up just such an option: we can inject the data services directly into the view. This means that we can consume the data right where we retrieve it without having to hammer it into some bloated DTO. We also don't have to worry about annotating our action or filling it with junk view specific code. To start let's create a really simple service to return states. Umm, looks like we're down to only two states, sorry Kentucky. Now we can add this to our container. I took a singleton approach and just registered a single instance in the Startup.cs. That's it! Now we have a brand new way of getting the data we need to the view without having to clutter up our controller with anything that should be contained in the view. First you must create a project by choosing ASP.Net which is in the File> New Project> Other Languages> Visual C #> Web> Select Empty ASP.Net Web Application. Right Click On aspproject05 in the top right corner select ADD> New Item> Web Form. And give CheckBox.aspx as a name. This script serves as the manufacture CheckBox with ID named chkNews, which says Do you want to get more update? sent or received by the server. This script is used to manufacture the ID button button named btnSubmit, that says Submit sent to the server to have an action Click if the button is clicked. This script serves to create a label with name ID lblResult the printed blanks to be sent to the server. The above code serves as outputan of chkBerita when checked or not displayed by a label that berID lblResult that are boolean. This means that when we press the button without us tick checkbox section will appear on labels False lblResult whereas if we check the CheckBox and pressing the button it will show True. If you have worked on ASP.NET MVC, you must be familiar with how when you type in an URL, the appropriate controller is chosen, and the action fired. 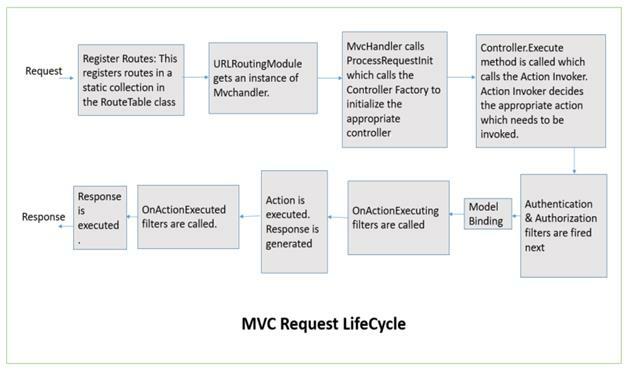 Today we will dig a little deeper within the MVC request life cycle. Before we start discussing its life cycle, let's briefly understand the concept of HttpHandlers and HttpModules. RegisterRoutes method stores the routes defined in that method, in a static collection in the Routetable class. Each route has an HttpHandler defined for it. In our case above, the MapRoute method defines the HttpHandler. Next, the URLRoutingModule is called. It matches the request route with the routes defined in the route table. It calls the GetHttpHandler method which returns an instance of an MVCHandler. The MVCHandler calls the ProcessRequest method. The controller execution and initialization happens inside this method. ProcessRequest calls ProcessRequestInit, which uses ControllerFactory to select an appropriate controller based on the supplied route. The ControllerFactory calls the Controller Activator which uses the dependency resolver to create an instance of the controller class. Once the controller is created its Execute method is called. Now comes the point where the action must be executed. The execute method in the controller calls the ExecuteCore method which calls the InvokeAction method of ActionInvoker. Action Invoker determines which action must be selected based on certain conditions, depending upon the methods available, their names and the action selectors used for them. Once the action is selected, Authentication & Authorization filters are fired next. Once the action passes through the authentication and authorization filter checks, the model binding takes place. The information needed for the action to execute is gathered in this step. OnActionExecuting action filters are fired next. Once the OnActionExecuting filters are executed a response for the action is generated. The thing to note here is that the response is generated at this stage, but not executed. Next, the OnActionExecuted filters are executed. Once all the filters have finished executing, the response is finally executed in the ExecuteResult method which is called from the InvokeActionResult by the ActionInvoker. If the response is a view or a partial view, the ViewEngine will render it, else it will be handled appropriately. The ExecuteResult will find the appropriate view using FindView or FindPartialView method. This method will search for the view in specific locations and then render it. This is the final step in generating the response. If you would like to further dig into the MVC request life cycle, I would highly recommend Alex Wolf’s pluralsight course by the same name. Sometimes, we need to create a PDF file that opens only when the users put in a password when prompted. Let us see how to create a password-protected PDF file in MVC. First, let's open Visual Studio and create a new project. We need to select the ASP.NET Web application type. 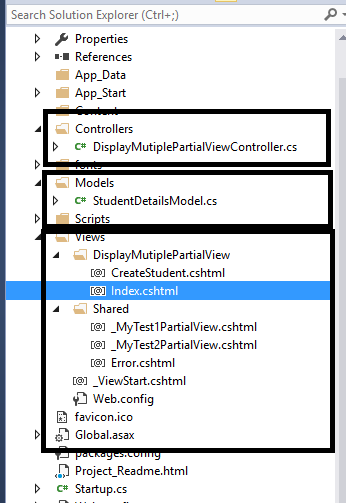 Select Web API as the template and in the "Add folders and core references" section, we need to select MVC and Web API. Click on "Change Authentication" on the right side pane and select "No Authentication". In the web.config file, let us define one key named Filepath and use it in our code. The PDF file must be present there. It is good to change the key's value when it's placed in web.config. Add the below code to the Home Controller. In the PDFFilepassword variable, you can set anything as password - the file name, PAN card number, or you can validate the entered value against the values stored in the database. In Route.config, we can define the default route with the Controller And ActionName. Run the website and enter http://localhost:49744/Home/DownloadFile. Here, Home is the controller name and DownloadFile is the action name. It shows the following Password prompt. After entering the right password and successful authentication, the PDF file will get opened. In some Web Applications, we need to show real time data to the end users, which means if any changes occur (new data available) in the Server, it needs to show an end user. For instance, you are doing chat in Facebook in one tab of your Browser. You opened another tab in the same Browser and send a message to the same user (with whom, you are doing chat in the previous chat). You will see that message will appear in both the tabs and it is called real-time push. In order to accomplish the functionality, mentioned above, the client sends interval basis AJAX requests to the Server to check, if the data is available or not. ServerSentEvents(SSE) API helps ensure the Server will push the data to the client when the data is available in the Server. What are Server Sent Events? We are going to implement a requirement like there is a link button and click on it and it displays current time each second on an interval basis. In order to achieve the same, we need to add the following action in HomeController. It sets response content type as text/event-stream. Next, it loops over the date and flushes the data to the Browser. Once we are done with the Server side implementation, it's time to add the code in the client side to receive the data from the Server and displays it. In the first step, it checks whether SSE is available in the Browser or not. If it is null, then it alerts to the end user to use other Browser. In the second step, if SSE is available, then it creates EventSource object with passing the URL as a parameter. Subsequently, it injects the events, mentioned below. onclose- It calls when the Server closes the connection. Here, we discussed about SSE(Server Sent Events). It is very important API available in HTML5. It helps to push data from the Server to the client when any changes occurs in the Server side. If you want to use a bidirectional communication channel, you can use HTML5 Web Sockets API. The disadvantage of SSE is it is Browser dependent. If the Browser doesn't support SSE, then the user can't see the data, but it is easy to use it. You can also use SignalR for realtime pushing the data to the end user. I have used Entity Framework to fetch the values and used Database First approach. I would also write an article on an Entity Framework but today, I would just show you how to bind the cascading dropdown list in this blog. I have two dropdownlists. One is for state and the other for city. I would populate the city, which is based on the state selection. You can add as many dropdownlists, as you want. For simplicity, I am using only two dropdowns. I have tblState and tblCity, where I have stateid as Primary key in the tblState table and stateid as the Foreign key in tblCity table. You can insert states and cities from the database as you wish. Now, with Entity Framework; create your EDMX file. In my case, I have named it ModelDemo.edmx. I have created a Model and named it Registration. This is not directly required but since I used a strongly typed View, so I have created Model. You can also add Model because if you write the httppost method to save the values to the database, then you would need the model. Now, this is my Controller code. Now, if you see my Controller code, I have a httpget method Details(). I am then calling a non-action method bindState() to bind the state ddl. On selection of the state ddl, the getCity() method will be called to bind the city ddl. I have used jQuery to get the Id of the selected item and have passed it to the getCity method to get the cites for the selected state. I have also used LINQ to get my desired select value w.r.t the Id passed. Right click on action method Details(), followed by clicking Add View. I always prefer a strongly typed View and I have also created a strongly typed View in this case. The name of my View is Details.cshtml. You need jQuery min.js. Just download it from the NuGet Package, if it’s not there. I have added the jQuery-min.js. From the code given above, we get the Id of the state ddl. I have used jQuery to get the ID of the state DDL on .change function and passed it to bind the city ddl. Now, just run your Application and you should get the output given below and if you do not get it, then check that if you are getting any values in an Id in getCity() method. If not, then check for Id mis-match. ASP.NET MVC 6 Hosting - HostForLIFE.eu :: How to Call Ajax Method Call with ASP.NET MVC? In this tutorial, let me show you how to call ajax method in ASP.NET MVC. Status = "Ajax called succesfully", Message = "Message show succesfully"
newCode : "Put the data here"
</script > < div > < button value = "Ajax Called"
I hope it works for you! Good luck! Restricting or limiting the file type extensions is a key business requirement. It is not necessary that a business allows all file types to be uploaded via their web application. Sometimes, only image files are accepted by the web application, sometimes only documents, and sometimes the combination of image, documents, and compressed file types are accepted by the web system. Today, I shall be demonstrating the process of limiting/restricting the desired upload file type extensions by implementing custom data annotation/attribute component on ASP.NET MVC5 platform. This article is not specific to image files only, you can use the provided solution with any type of file format as well. Following are some prerequisites before you proceed any further in this tutorial. You can download the complete source code for this tutorial or you can follow the step by step discussion below. The sample code is being developed in Microsoft Visual Studio 2015 Enterprise. Create a new MVC web project and name it as "ImgExtLimit". You need to add/update the "executionTimeout", "maxRequestLength", and "maxAllowedContentLength" property values if not already added in the "Web.config" file, as shown below. executionTimeout -> Amount of time required to process your request on the web server. The value is provided in seconds. maxRequestLength -> Maximum size which your request can capture and send to the web server. The value is provided in bytes. maxAllowedContentLength -> Maximum allowed size of your content (e.g. file, text data etc.) that is sent to the web server. The value is provided in bytes. Open the "Views->Shared->_Layout.cshtml" file and replace the code with the following. In the above code, I have simply created a basic default layout page and linked the require libraries into it. Create a new "Helper_Code\Common\AllowExtensionsAttribute.cs" file and add the following code. // Copyright (c) Allow to distribute this code and utilize this code for personal or commercial purpose. /// Gets or sets extensions property. In ASP.NET MVC 5, creating customized data annotations/attributes is one of the cool features. The ASP.NET MVC 5 platform already contains a default FileExtensions attribute, but, the issue with this pre-built data annotation/attribute is that it is applicable only on string type view model properties and in my case, I am uploading the files via "HttpPostedFileBase" data type view model property. This means that the pre-built data annotation/attribute does not have any means to know the data type of the file(s) that I am uploading which will have no effect on the limitation that is considered to be applied on the uploaded file type extensions. Of course, there are many other tricks or workarounds to go through while working with the pre-built FileExtensions attribute, but, I prefer the custom data annotation/attribute mechanism, which is much simpler. So, in the above code, I have created a new class "AllowExtensionsAttribute" (by following the naming convention of custom attribute class) and inherited the ValidationAttribute class. Then, I have created a public property "Extensions" and set the default value with image file type extensions, which means that my custom attribute will accept only image file type to be uploaded. So, in order to allow the required file type extensions, this property will be updated at the time of my custom attribute utilization accordingly. Finally, I have overridden the "IsValid(....)" method which will receive my uploaded file as "HttpPostedFileBase" data type and from this, I will extract the file type extension of the uploaded file and then validate whether it is according to either default file type extension restriction or according to my provided file type extensions. Now, create a new "Models\ImgViewModel.cs" file and replace the following code in it i.e. /// Image view model class. /// Gets or sets Image file property. /// Gets or sets message property. /// Gets or sets is valid propertty. In the above code, I have created my view model which I will attach with my view. Here, I have created HttpPostedFileBase type file attachment property which will capture uploaded image/file data from the end-user, then I have also applied my custom "AllowExtensions" attribute to the FileAttach property and provide the list of file type extensions separated by a comma (,) that I have allowed my system to accept. Then, I have created two more properties; i.e., Message of data type string and isValid of data type Boolean for processing purpose. Create a new "Controllers\ImgController.cs" file and add the following code to it. In the above code, I have created a GET "Index(...)" method which will initialize the view model with default values and send it to the view page. Finally, I have created a POST "Index(...)" method which will receive an input image file from the end-user, then validate the view model for allowed file type extensions and then send the response message accordingly. Now, create a view "Views\Img\Index.cshtml" file and add the following code to it. In the above code, I have created a simple view for uploading the image file to the server which will validate the allowed file type extensions at the server side. ASP.NET MVC 6 Hosting - HostForLIFE.eu :: How to Fix Bundles Are Not Working After Hosting To MVC Application? If your bundles are not getting configured properly in your server, I have fixed this issue, and here I am going to share with you how you can also fix this error. I hope you will like this. Recently, I hosted one of my MVC applications to Microsoft Azure cloud. And we usually publish our application in release mode, right? So here comes the problem. You can replicate the same issue in your local machine itself. Just make the debug attribute to false in your Web.config as follows. And when you run, you will get a prompt as follows. Just select Run without debugging option. Now once after your application is run, you can see some script errors in your browser console saying that the references are not loaded correctly. And finally I found the solution. Here we will see that. "Bundles Are Not Working After Hosting To MVC Application"
As I said, the problem is with your bundle config settings. There are few things you must check before going to the last fix. Please make sure that you have used StyleBundle for creating the style bundle. Please make sure that you have used ScriptBundle for creating the style bundle. Make sure that you are loading the styles using @Styles.Render. Make sure that you are loading the scripts using @Scripts.Render. Make sure that the folder structure is same as you have in local system. If none of the above solution works, you can try the last one. Make sure that virtual path of bundles doesn’t contains the folder names you have in your solution. I will explain it. In my case my bundles were as follows. And I have the folders JQWidgets in my root script folder. This was making the issue. And I referenced the same bundles as follows in my views. Please try these steps and build your application. Once that is done you can publish your application to cloud. I hope this will solve your issue. Have a happy coding. Did I miss anything that you may think is needed? Did you find this post useful? I hope you liked this article. Please share with me your valuable suggestions and feedback. A blog isn’t a blog without comments, but do try to stay on topic. If you have a question unrelated to this post, you’re better off posting it on C# Corner, Code Project, Stack Overflow, ASP.NET Forum instead of commenting here. Tweet or email me a link to your question there and I’ll definitely try to help if I can. It is just small modifications if JSON is not provided handle it. And use this Controller as base controller. Step 4: Your action code is below. I have added the 2 partial views. Basically we are converting the partial view with objects into the string format. Header = "Header", Footer = "Footer"
Step 5: In View display this JSON data ajax in below way . 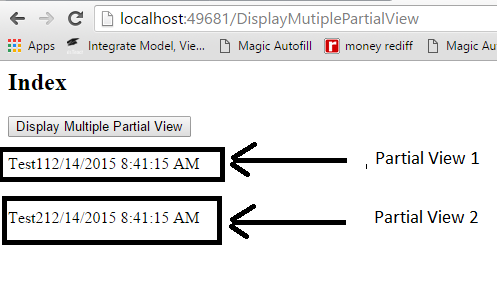 In below code PartialViewDiv1 and PartialViewDiv2 are two divs in which two partial views will be displayed. I have two partial views you may load more partial views.